by Chris Woodford. Last updated: September 13, 2018. Move over bulbs: there are better ways to make light now! There are those compact fluorescent lamps, for example—the ones that save you energy and money. But, even better, there are LEDs (light-emitting diodes) that are just as bright as bulbs, last virtually forever, and use hardly any energy at all. An LED is a special type of diode (a type of electronic component that allows electricity to flow through in only one direction). Diodes have been around for many decades, but LEDs are a more recent development. Let's take a closer look at how they work! Photo: Unlike incandescent lamp bulbs (used in things like flashlights), which burn out relatively quickly, LEDs are extremely reliable—so much so, that they're typically soldered right onto electronic circuit boards. They virtually never wear out! 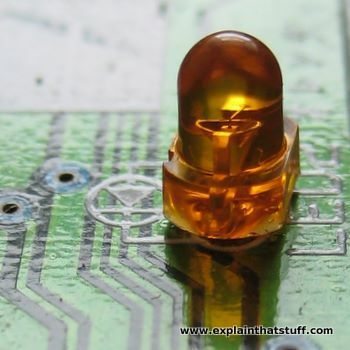 This is the tiny LED indicator lamp from a computer printer's control panel. Photo: LEDs are much smaller than lamp bulbs and use a fraction as much energy. They are particularly suitable for use in instrument panels, which have to be lit up for hours at a time. Put many diodes together and you can make as much light as a conventional bulb but use only a fraction as much energy. If you know a bit about electricity, you'll know that materials fall broadly into two categories. There are some that let electricity flow through them fairly well, known as conductors, and others that barely let electricity flow at all, known as insulators. Metals such as copper and gold are examples of good conductors, while plastics and wood are typical insulators. What's the difference between a conductor and an insulator? Solids are joined together when their atoms link up. In something like a plastic, the electrons in atoms are fully occupied binding atoms into molecules and holding the molecules together. They're not free to move about and conduct electricity. But in a conductor the atoms are bound together in a different kind of structure. In metals, for example, atoms form a crystalline structure (a bit like equal-sized marbles packed inside a box) and some of their electrons remain free to move throughout the whole material, carrying electricity as they go. Not everything falls so neatly into the two categories of conductor or insulator. Put a big enough voltage across any material and it will become a conductor, whether it's normally an insulator or not. That's how lightning works. When a cloud moves through the air picking up electric charge, it creates a massive voltage between itself and the ground. Eventually, the voltage is so big that the air between the cloud and the ground (which is normally an insulator) suddenly "breaks down" and becomes a conductor—and you get a massive zap of lightning as electricity flows through it. Certain elements found in the middle of the periodic table (the orderly grouping of chemical elements) are normally insulators, but we can turn them into conductors with a chemical process called doping. We call these materials semiconductors and silicon and germanium are two of the best known examples. Silicon is normally an insulator, but if you add a few atoms of the element antimony, you effectively sprinkle in some extra electrons and give it the power to conduct electricity. Silicon altered in this way is called n-type (negative-type) because extra electrons (shown here as black blobs) can carry negative electric charge through it. In the same way, if you add atoms of boron, you effectively take away electrons from the silicon and leave behind "holes" where electrons should be. This type of silicon is called p-type (positive type) because the holes (shown here as white blobs) can move around and carry positive electric charge. Artwork: N-type silicon has extra electrons (black blobs), while p-type silicon has a lack of electrons that we can think of as "extra holes" (white blobs). LEDs are simply diodes that are designed to give off light. When a diode is forward-biased so that electrons and holes are zipping back and forth across the junction, they're constantly combining and wiping one another out. Sooner or later, after an electron moves from the n-type into the p-type silicon, it will combine with a hole and disappear. That makes an atom complete and more stable and it gives off a little burst of energy (a kind of "sigh of relief") in the form of a tiny "packet" or photon of light. N-type silicon (red) has extra electrons (black). P-type silicon (blue) has extra holes (white). 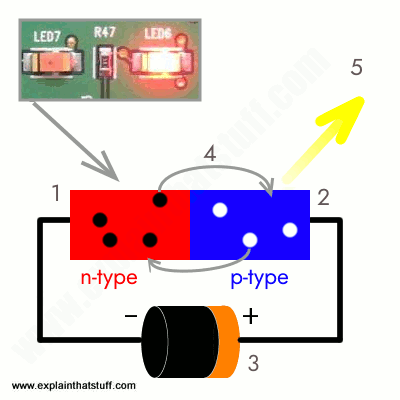 Battery connected across the p-n junction makes the diode forward biased, pushing electrons from the n-type to the p-type and pushing holes in the opposite direction. Electrons and holes cross the junction and combine. Photons (particles of light) are given off as the electrons and holes recombine. Photo: LEDs are transparent so light will pass through them. You can see the two electrical contacts at one end and the rounded lens at the other end. The lens helps the LED to produce a bright, focused beam of light—just like a miniature light bulb. LEDs are specifically designed so they make light of a certain wavelength and they're built into rounded plastic bulbs to make this light brighter and more concentrated. Red LEDs produce light with a wavelength of about 630–660 nanometers—which happens to look red when we see it, while blue LEDs produce light with shorter wavelengths of about 430–500 nanometers, which we see as blue. (You can find out more about the wavelengths of light produced by different-colored LEDs on this handy page by OkSolar). You can also get LEDs that make invisible infrared light, which is useful in things like "magic eye" beams that trigger photoelectric cells in things like optical smoke detectors and intruder alarms. Semiconductor lasers work in a similar way to LEDs but make purer and more precise beams of light. Whom should we thank for this fantastic little invention? Nick Holonyak: he came up with the idea of the light-emitting diode in 1962 while he was working for the General Electric Company. You might like to watch a short (4-minute) video about Nick Holonyak's life and work and his thoughts about the future of LEDs (courtesy of the Lemelson Foundation); if you're feeling more technically minded, you can read all about the solid-state physics behind LEDs in the patents listed in the references below. What's so good about LEDs? Photo: The red LEDs shining down from the top of this container are being used to test a way of growing potatoes in space. LEDs are more suitable than ordinary light because they don't produce heat (which would make the plants dry out). 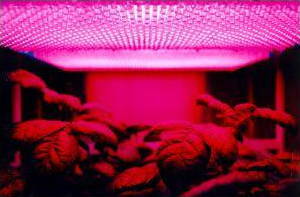 The red light these LEDs produce makes the plants photosynthesize (produce growth from light and water) more efficiently. Photo by courtesy of NASA Marshall Space Flight Center (NASA-MSFC). They're tiny and relatively inexpensive. They're easy to control electronically. They last virtually forever. That makes them brilliant for traffic signals. They make light electronically without getting hot and that means they save lots of energy. Artwork: The structure of an early design for a blue-light LED built from multiple layers on a sapphire (Al2O3 substrate. 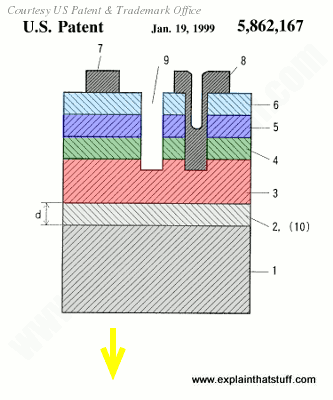 The numbers in the figure indicate: 1 = the sapphire substrate; 2 = aluminum nitride buffer layer; 3 = n-type layer made from gallium nitride doped with silicon; 4 = semi-insulating, semi-p-type layer made from indium gallium nitride; 5 = p-type aluminum gallium nitride clad layer; 6 = p-type layer made of gallium nitride doped with magnesium ; 7 = aluminum positive electrode; 8 = aluminum negative electrode; 9 = insulating groove between electrodes. 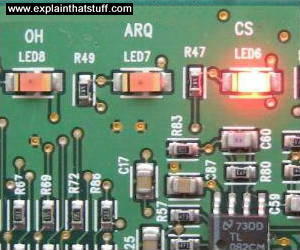 The LED emits light downward in this case, as shown by the yellow arrow. Artwork from US Patent 5,862,167: Light-emitting semiconductor device using gallium nitride compound by Michinari Sassa et al (co-authors include the Nobel-Prize winners Isamu Akasaki and Hiroshi Amano), courtesy of US Patent and Trademark Office. It's the best part of five decades since Nick Holonyak invented the LED, but the technology is still developing. In the 1970s, scientists discovered they could make LEDs from organic (carbon-based) materials, giving rise to OLEDs (organic LEDs) that are now becoming popular in thin, flat, and sometimes even flexible displays. Two decades later, three Japanese-born scientists (Isamu Akasaki, Hiroshi Amano, and Shuji Nakamura) invented blue-light-emitting diodes using the semiconductor gallium nitride, earning them the Nobel Prize in Physics in 2014. Red and green LEDs had been around for years—if you can remember early digital watches, you'll know their LED displays were always red—but blue light had always proved elusive. The conquest of the blue LED made it possible to produce perfect white light (either by combining red, green, and blue LEDs or by shining blue light through a white phosphor), so enabling energy-efficient LED lamps to compete effectively with older and less efficient technologies like incandescent bulbs and compact fluorescent lamps (CFLs). Gallium-nitride LEDs are also now finding their way into full-size color displays: they're very much brighter and considerably more efficient than rival LCD displays and OLEDs, though not so good at large screen sizes. MAKE presents: The LED: A friendly 5-minute video introduction from MAKE's quirky Collin Cunningham. Collin explains how LEDs were discovered and shows how to make one of your own! [PDF] Blue LEDs—Filling the world with new light: An easy-to-understand account of how three Japanese-born scientists scooped the 2014 Nobel Prize in Physics with the development of energy-efficient, blue gallium nitride LEDs. Instructables: LED projects: Inexpensive, funky, and safe, LEDs are great for all kinds of electronic projects—and are particularly good for teaching kids about simple electronic circuits. MAKE: Electronics by Charles Platt. O'Reilly, 2015. A clear and simple, hands-on introduction to electronics. Understanding Modern Transistors and Diodes by David L. Pulfrey. Cambridge University Press, 2010. Comprehensive textbook for undergraduates and graduate students. Explains the solid-state theory behind transistors and diodes, including applications such as solar cells, LEDs, memories, and power transistors. Light-Emitting Diodes by E. Fred Schubert. Cambridge University Press/E. Fred Schubert, 2018. Opens with the history and theory of LEDs before covering their electrical and optical properties, packaging, and uses. Coming Soon to a Wrist Near You: MicroLED Displays by Samuel K. Moore. IEEE Spectrum, March 19, 2018. Could gallium nitride-based LEDs be the future of portable displays? How Lasers Inspired the Inventor of the LED by Nathan Hurst. Wired, October 9, 2012. A brief interview with Nick Holonyak about the invention and future development of LEDs. 50 Years of LED Technology by Roberto Baldwin. Wired, October 8, 2012. A fascinating photo gallery of the benefits LEDs have brought to many areas of modern life. The Lightbulb That Really Is a Better Idea by Paul Wallich. IEEE Spectrum, December 30, 2010. What are the prons and cons (and the technical challenges) of building LEDs into a conventional, energy-saving lamp? The LED's Dark Secret: Solid-state lighting won't supplant the lightbulb until it can overcome the mysterious malady known as 'droop' by Richard Stevenson. IEEE Spectrum, August 1, 2009. Why don't LEDs work efficiently at higher current levels? US Patent 3,249,764: Forward biased negative resistance semiconductor devices by Nick Holonyak, Jr., General Electric Company. Issued May 3, 1966. Nick Holonyak's original patent explains the theory of LED-type devices. US Patent 3,936,855: Light-emitting diode fabrication process by James Emanuel Goell et al, International Telephone and Telegraph Corporation. Issued Feb 3, 1976. How are LEDs made? This patent outlines one method of making them developed in the early 1970s. US Patent 5,862,167: Light-emitting semiconductor device using gallium nitride compound by Michinari Sassa et al, Research Development Corp of Japan/Toyoda Gosei Co Ltd., January 19, 1999. One of the more recent patents covering blue-light LEDs.